Visual arts abound in South Coast Metro. Take a leisurely walking tour to experience the spectacular works of Jean Dubuffet, Henry Moore, Joan Miro, Charles O. Perry and Isamu Noguchi, among other world-class figures whose artistry is on display locally. 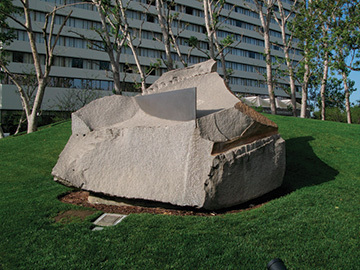 The centerpiece is Isamu Noguchi’s 1.6-acre collection of sculptures and plantings called California Scenario. This sculpture and horticultural landscape present an abstract, condensed vision of the Golden State itself. Segerstrom Center for the Arts is committed to supporting artistic excellence, offering unsurpassed experiences and to engaging the entire community in new and exciting ways through the unique power of live performance and a diverse array of inspiring arts-based education and community engagement programs. The Center presents a broad range of programming for audiences of all ages, including international ballet and dance, national tours of top Broadway shows, jazz and cabaret, contemporary artists, classical music performed by renowned chamber orchestras and ensembles, family-friendly programming and year-round, free events open to the public on the Julianne and George Argyros Plaza. Soaring through the facade of Segerstrom Center for the Arts’s Segerstrom Hall is Fire Bird, a major architectural sculpture of enormous scale created by renowned sculptor Richard Lippold. Made of red, gold and silver aluminum and steel, Fire Bird’s vibrant colors are about the colors and rhythms of music and how they relate to the asymmetric architecture of Segerstrom Center for the Arts. The great glass wall that encloses the lobby areas permits a visual continuity between the inside and outside of the building, while the balconies on each level allow patrons to experience the sculpture at close proximity. 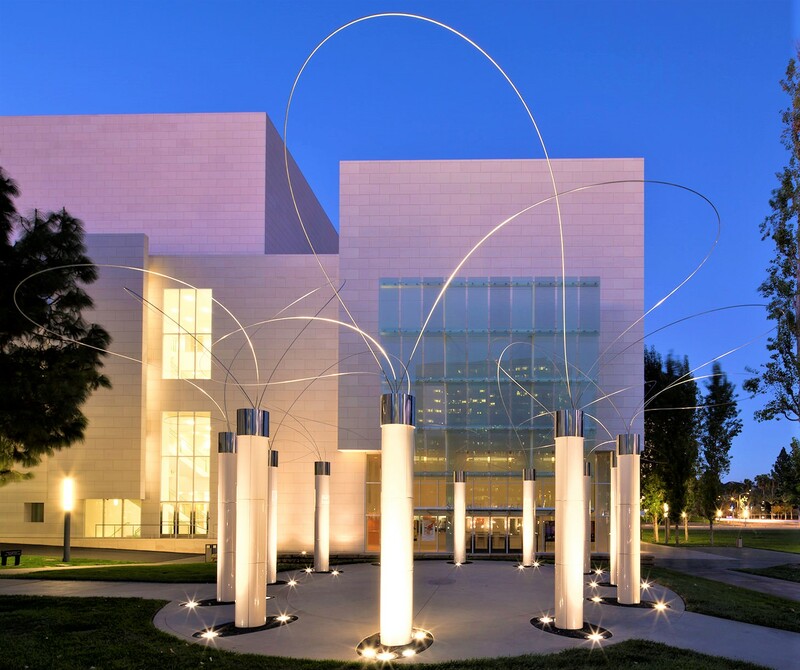 Located in Segerstrom Center for the Arts. 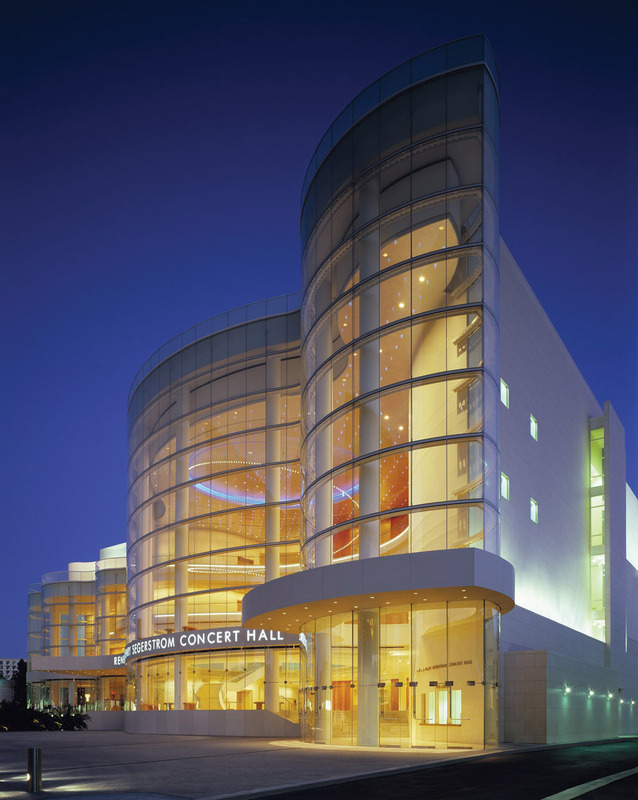 In September 2006, Segerstrom Center for the Arts inaugurated its beautiful 2,000-seat Renée and Henry Segerstrom Concert Hall, 500-seat multi-use Samueli Theater and an education center. The magnificent new structure was designed by internationally respected Argentine architect Cesar Pelli in concert with one of the world’s foremost acousticians, Russel Johnson of Artec. The Renée and Henry Segerstrom Concert Hall’s signature is an undulating curtain of glass that forms the north wall. Pelli wanted to design a “very Southern California” building and to him the walls represent the waves of the Pacific Ocean and the waves of sound that will emanate from the performers. 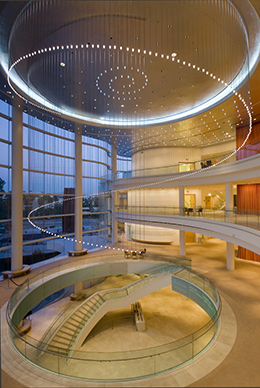 Four stories above the Renée and Henry Segerstrom Concert Hall lobby is a stunning piece of architectural jewelry. Three hundred individual strands of highly polished stainless-steel form a circular pattern 40-feet in diameter. The strands are in graduated lengths, the longest reaching 40 feet. Each holds a 2 ½ -inch width bulb frame and a 1.4-watt “Jupiter” LED covered with a clear Baccarat crystal globe, except the longest, which is colored in “Baccarat red.” The combination of elements results in an intense sparkle that is reflected in the polished surfaces and glass. In addition are Swarovski crystal “stars” and sweeping coves also illuminated by LED. Located in the lobby of the Renée and Henry Segerstrom Concert Hall. The Connector consists of five twisted, sinuous steel plates that stand together, forming a hollow structure that visitors can walk into and through. Up close, the surface of the steel is painted beautifully by natural oxidation and weather, leaving a complex pattern. At 64 feet tall and 360 tons, the structure is an impressive focal point. 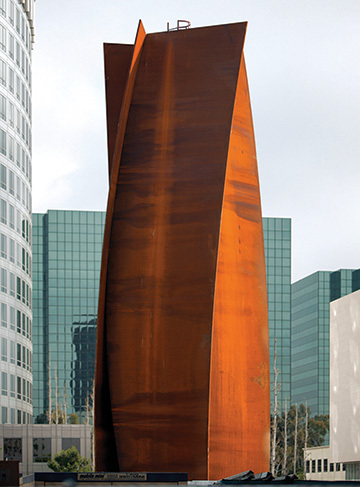 Serra’s sculptures have been installed or exhibited in museums worldwide, such as at the Museum of Modern Art in New York, the Los Angeles County Museum of Art, and the Guggenheim Museum Bilbao in Spain. 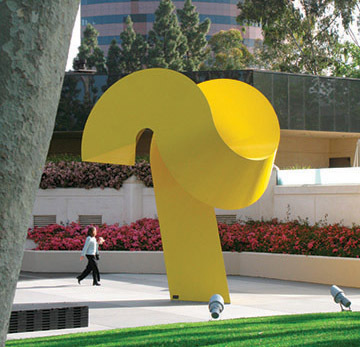 Located in the pedestrian plaza between the Segerstrom Center for the Arts and the Renée and Henry Segerstrom Concert Hall. By designing a void in the mass of his Reclining Figure, Henry Moore encourages us to see that space around the figure is as important as solid material. 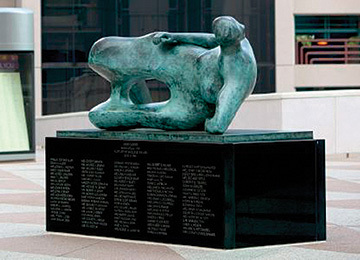 One of the undisputed giants of 20th century sculpture, Moore has captured the dignity and living force of a woman through his mastery of open and closed form. Moore’s works may be seen in New York City’s Guggenheim Museum, the Metropolitan Museum of Art and in the National Gallery of Art in Washington, D.C. Located at Segerstrom Center for the Arts. Joan Miro’s cast bronze Oiseau is a “bird” of a monumental and highly unorthodox order. Its bulbous volumes and spiky projections lend it a whimsical character, thoroughly in keeping with the great Spanish surrealist’s sense of humor. The works of Miro have been exhibited in major galleries throughout the world, including the Museum of Modern Art in New York. Located in the lobby of the Center Tower on Town Center Drive. 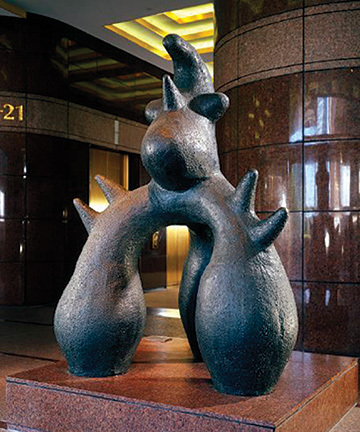 Center Tower is blessed with two bronzes by Sweden’s most celebrated sculptor, Carl Milles. In Sun Glitter, a mermaid, hair flying, rides a dolphin through the spray as smaller fish circle around them while Jonah and the Whale re-enacts the popular Biblical story. In his homeland, Milles is to Swedish sculpture what Frank Lloyd Wright is to American architecture. Located outside of the Center Club in the lower level of Center Tower on Town Center Drive. Tony Smith’s white marble sculpture, Fermi, is an homage to Enrico Fermi, the Nobel Prize-winning Italian physicist who brilliantly investigated quantum theory and atomic structure. Smith asks us to consider the complex structure of things while simultaneously giving us a handsome form that is appreciated for its uncomplicated elegance. The artist’s works are widely displayed in major collections including the National Gallery of Art in Washington D.C. Located in the Center Club lobby of Center Tower. George Rickey harnesses the wind as his partner and uses real movement in his perfectly balanced kinetic creation, Four Lines Oblique Gyratory-Square IV. Rickey is noted around the world for his gravity and wind-driven sculptures that respond to the same laws of motion in nature. His works are on display in galleries worldwide. Located at the Center Tower on Park Center Drive. As the preeminent visual arts organization in Orange County, OCMA is committed to making the arts accessible to all, and offers a host of programs that engage the community with contemporary art and artists. For the past 56 years, OCMA, has enriched the lives of a diverse and changing community, presented exhibitions of 20th and 21st century art that have traveled nationally and internationally, and built a collection of more than 3,500 works. In May 2018, OCMA presented designs for the museum’s new three-story building at SCFTA. 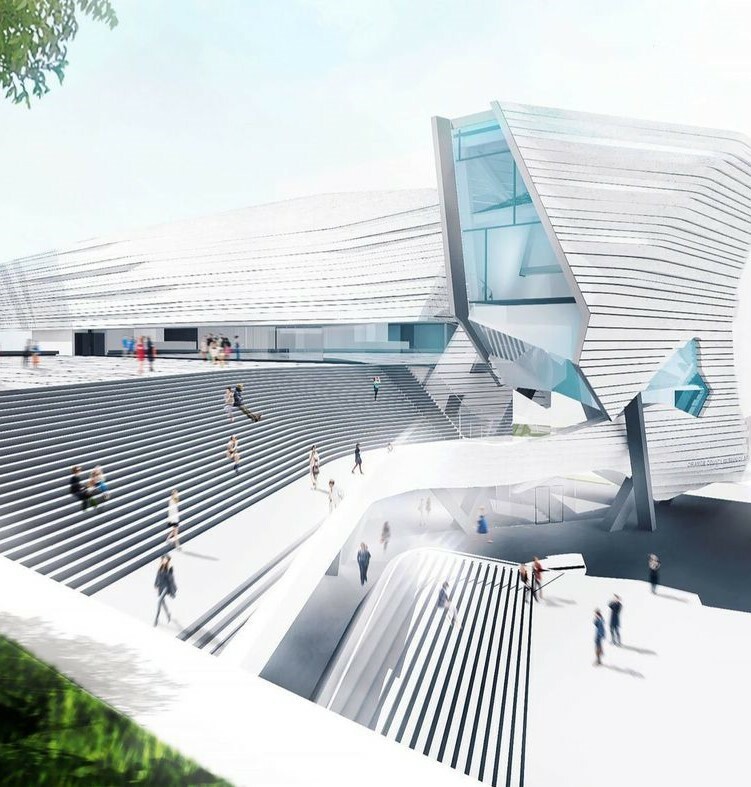 The structure, which would be next to the Segerstrom Concert Hall, is designed by Pritzker Prize-winning architect Thom Mayne and his firm, Morphosis. Groundbreaking for the new building will take place in 2019, with a projected opening in 2021. 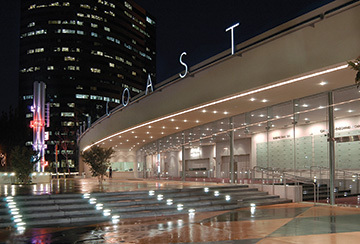 South Coast Repertory was founded in the belief that theatre is an art form with a unique power to illuminate the human experience. The theatre is committed to exploring the most urgent human and social issues of our time, and to combining literature, design and performance in ways that test the bounds of theatre’s artistic possibilities. SCR undertakes to advance the art of theatre in the service of the community, and aims to extend that service through educational, intercultural, and outreach programs that harmonize with its own artistic mission. The three pieces, “The Story Teller,” “Upstage/Downstage” and “Herald,” were designed by Jason Meadows. Meadows created this trio especially for South Coast Repertory, with the intention of bringing the theater into the outdoors. 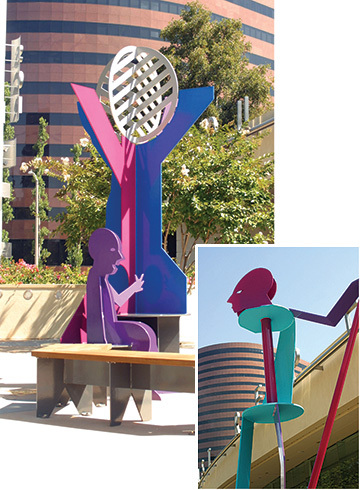 These pink, purple, blue and silver sculptures not only invite the audience to continue their theatrical experience, but also provide patrons with a place to sit on sunny days. Located at South Coast Repertory. Jim Huntington’s Night Shift provides a perfect complement to the natural setting of Town Center Park. Cut from a massive chunk of Sierra white granite, the piece is abruptly sliced through the top by a plate of polished, stainless steel. Huntington’s works have been exhibited in San Francisco, Boston, New York, and Los Angeles. Charles O. Perry’s bright-yellow steel abstraction’s title and form suggest that Perry was inspired by animal horns, but he has taken the idea so dramatically into the realm of abstraction that The Ram literally rises above any reference to nature. 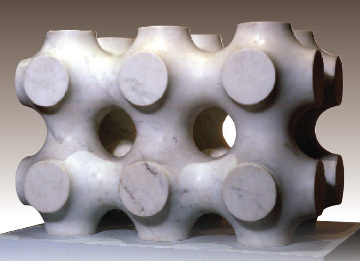 Perry’s works are featured in the Museum of Modern Art in New York City, the Art Institute of Chicago, San Francisco Museum of Modern Art, and the Smithsonian Institution in Washington. 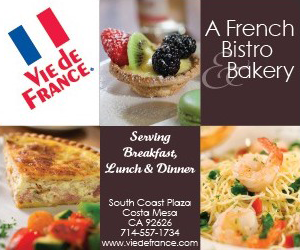 Located between Park Tower and The Westin South Coast Plaza. 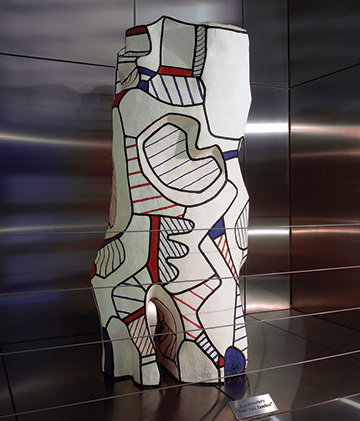 Jean Dubuffet’s Tour Aux Jambes can be translated as “Encirclement of Limbs” or “Tower of Legs.” This artwork, made of epoxy and polyurethane, is rather like a three-dimensional jigsaw puzzle, though its lines are only on the surface. The artist’s works—in characteristic Dubuffet colors of red, white, blue and black—may be seen in New York City’s Guggenheim Museum, the Metropolitan Museum of Art and in the National Gallery of Art in Washington, D.C. Located in Park Tower on Town Center Drive and Bristol Street. 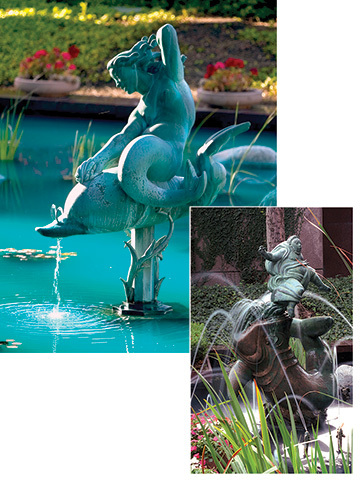 The Olympian god of the sea is an apt choice for artist Betty Davenport Ford’s elaborate waterworks, Neptune Water Spouts. 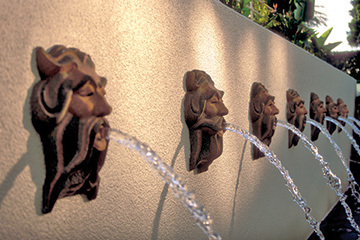 Outside of the lobby of The Westin South Coast Plaza are seven identical ceramic Neptune heads spouting water into the pools below. As one of Southern California’s most respected homegrown artists, many of her pieces are on display in public spaces in California, Arizona, Michigan and New York. 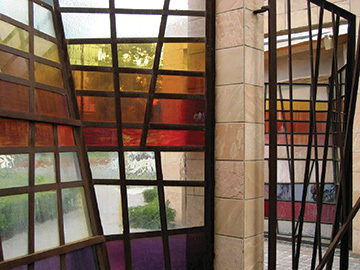 Sun Ribbon has artfully orchestrated strips of gold, orange, red, violet, and clear-textured glass to form a translucent windscreen. Falkenstein achieved the interesting and functional design by the interplay between space and form. Like the sun this colorful stained-glass wall radiates forth light and cheer. Sun Ribbon is a masterfully designed piece of functional art that creates a bright, vigorous counterpoint to the solemn vertical rise of surrounding buildings. Located in the Pacific Arts Plaza next to TGI Fridays. 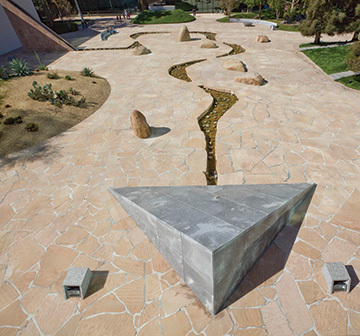 South Coast Metro is home to Isamu Noguchi’s 1.6-acre collection of sculptures and plantings, California Scenario, which presents the artist’s abstract, condensed vision of the Southern California landscape. The complexities of the garden’s design and scope provide a captivating retreat amidst Pacific Arts Plaza’s reflective glass, high-rise office towers. Throughout the garden, Noguchi has incorporated essential elements that portray the range of California’s different ecosystems. These elements include an “Energy Fountain,” “The Spirit of the Lima Bean” sculpture, sandstone paving, granite benches and areas aptly named the “Forest Walk” and the “Desert Land.” A visit to the garden, which has garnered praise as one of the most artistically noteworthy outdoor sculpture gardens in Southern California, can elicit an awe-inspiring appreciation for the vast breadth of nature that is found throughout the entire Golden State. Noguchi’s sculptures, unique fountains and often monumental landscape projects may be seen in cities around the globe. Located in Pacific Arts Plaza at the intersection of Anton Boulevard and Avenue of the Arts. 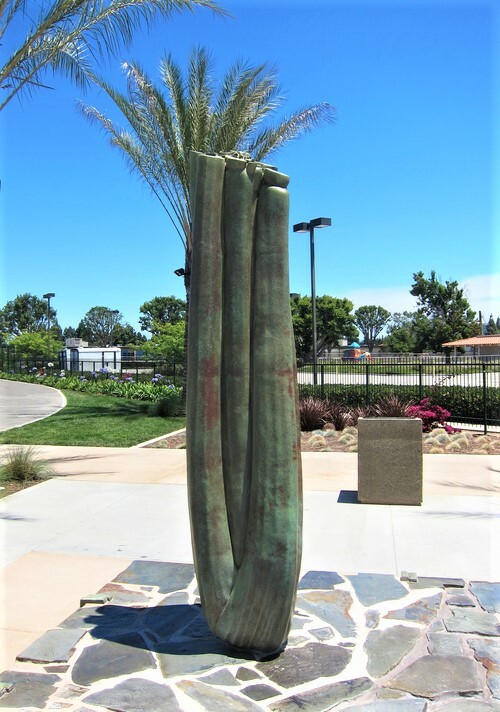 A sculpture by internationally renowned Japanese artist Aiko Miyawaki, Utsurohi 91 – Costa Mesa consists of a dozen 10-foot columns set in an elliptical configuration with chromium-plated steel “threads” intertwining in graceful patterns at the top of each column. Aiko has chosen the 12 Chinese Zodiac signs to decorate her graceful columns. As one of Japan’s leading artists, Miyawaki’s sweeping modern wire sculptures are spread throughout the world. Located on a grassy rectangle adjacent to Plaza Tower on Anton Boulevard and Avenue of the Arts. Seven pelicans, with 10-foot wingspans, and seven gulls, with three-foot wing spans, seem to shimmer off the lake’s surface. 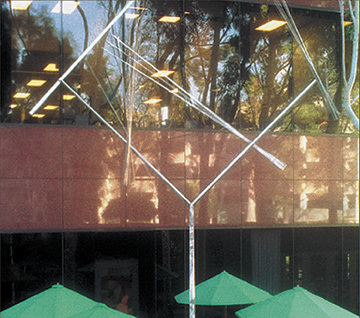 Van Sant specifically designed this sculpture to be seen from the surrounding office buildings. It is a representative view captured from high above our coastline cliffs. Howe’s work continues to connect with international communities, exhibiting and completing site-specific commissions both in the US and abroad. Known for his sculpture practice, Howe’s focus also includes the representation of objects through diverse means, including photography. This sophisticated stainless-steel piece was executed in 2011. Paloma catches viewers’ attention with its bright orange and green colors. 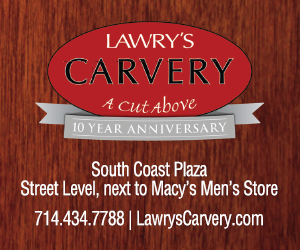 Located outside of Courtyard Santa Ana on MacArthur Boulevard. This stainless-steel project is 14-feet high and valued at $125,000. The site’s links to aviation history influenced the sculpture’s design. After Jon Seeman consulted the Orange County Historical Society, he learned that the Martin Airfield was located one-half mile south of the project site in 1923 to 1939. Seeman’s abstract sculptures evoke a sense of motion frozen in time. Heavy steel forms appear to float and align in an unexpected balance. Seeman meticulously cuts, forms and welds each steel shape in his art studio. Once all the forms are completed they are chain hoisted into place and welded into a dynamic composition. Located at The Marke on Main Street and Sandpointe Avenue. We Too Were Once Strangers is a celebration of the heritage and achievement of the Japanese American farmers of Orange County. In 1940, there were 245 Japanese “Issei” farms in Orange County. The memorial is located on land once cultivated by the immigrant farmers. Celery was one of the four main crops that were grown. The stone paving of the base recalls pathways in traditional Japanese gardens, which often featured recycled millstones as accents. The $80,000 bronze celery stalk sits on a cement base, which is reminiscent of several elements found in Japanese gardens. The platform is paved to look like a pathway and has a millstone. Turner hopes the sculpture will represent a bridge between the county’s past and its present. Located on the corner of Sunflower Avenue and Sakioka Drive. Known as one of the pioneers of Abstractionism, Minimalism and Op Art on the West Coast, Tony DeLap’s work has been widely exhibited both nationally and internationally. 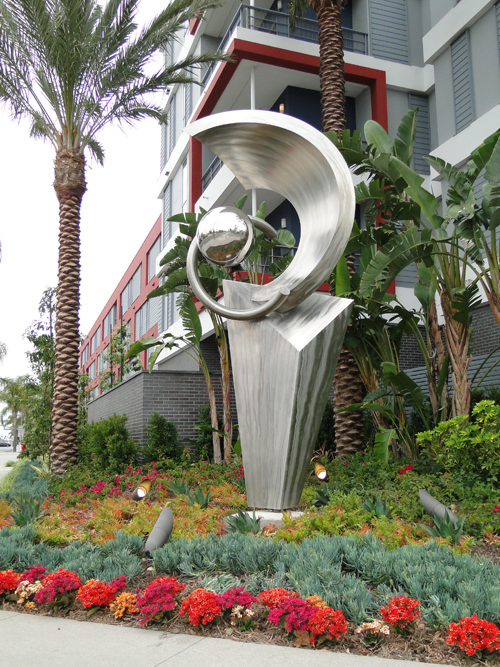 The Mysticana 2009 was commissioned by a California developer as an Art in Public Places project for the city of Santa Ana. 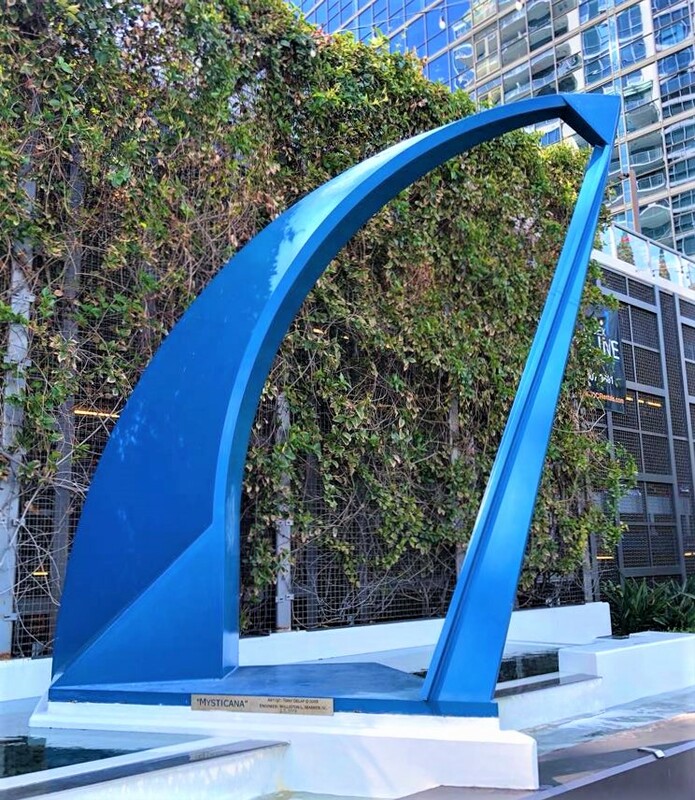 The curved, angular sculpture with its bold shade of blue offers a nice contrast to the straight columns and rectangular windows of the apartment towers. The fabricated mild steel sculpture was high-definition plasma-cut, formed, rolled, and welded. The sculpture was sent out for sandblasting and then heavily undercoated, put on a flatbed, and sent to Santa Ana. Located in the front driveway of Essex Skyline at MacArthur Place. 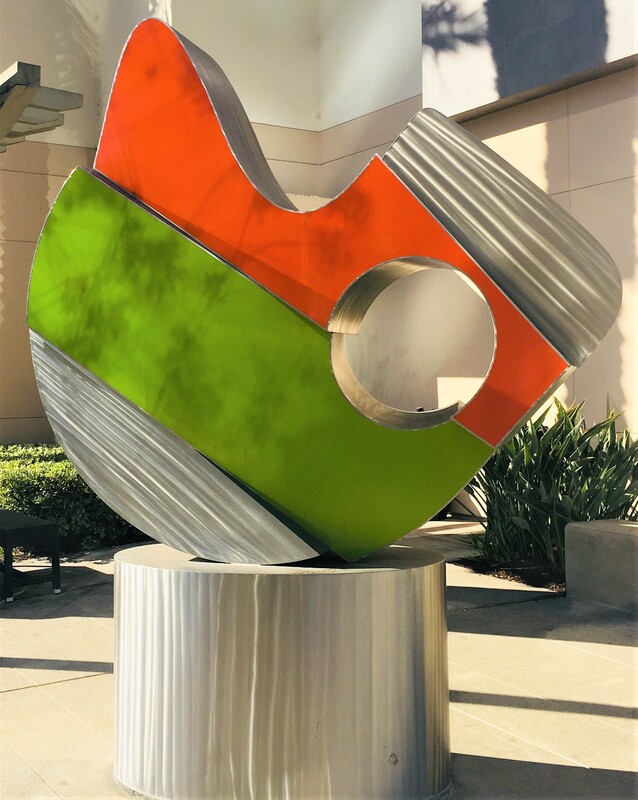 Click below to read more about the public art of the South Coast Metro area including performing art venues, outdoor sculpture, and other sculpture all within walking distance and available to be enjoyed by the public without charge. Included are brief histories of the artists and their works.